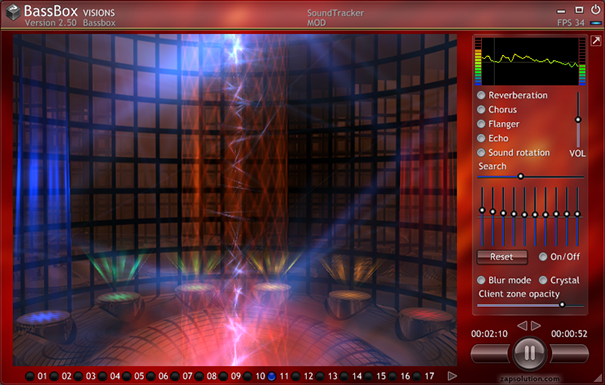 BassBox is a multimedia audio player designed to work with Windows XP, VISTA, W7, exclusively. It is able to work in full composited mode, in either "Blur" or "Crystal", when the AERO mode is on. BassBox uses dedicated OpenGL visual plugins that have been written specifically to provide the best multimedia experience. • Play audio stream: aif, mp1, mp2, mp3, ogg, wav, wma. • Play music tracker: it, mod, mtm, s3m, umx, xm. • Play compressed music tracker: mo3. • Playlist, using the ".bbp" extension (to play from the internet using either "http://" or "ftp://"). • More than 20 exclusive OpenGL visual plugins. • Windowed or full screen effect visualization. • Audio settings: reverberation, chorus, flanger, echo, sound rotation. • Use drag and drop to play directly from files or folders. • Skinned interface with background library. • Detailed CHM help file. The complete project is hosted here. Note: In order to download the full project, you must first register using your real name.